The success story of the passion cantata 'Der Tod Jesu' is without its equal in the music history of the eighteenth and nineteenth centuries and gradually obscured the rest of the composer Carl Heinrich Graun�s extensive vocal and instrumental oeuvre. 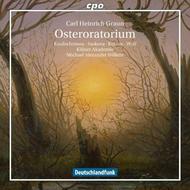 His Easter Oratorio, which cpo is now releasing as a recording premiere in an interpretation on historical instruments by the K�lner Akademie under the conductor Michael Alexander Willens, unfortunately suffered the same fate. The music is extremely imaginative and festive and displays a musical affinity to Bach�s cantata oeuvre.